Pros: You want great performance with a subdued, mellow version of the Flowmaster sound? The 50-series units, available in eight different inlet/outlet configurations with pipe sizes from 2.25-3.0 inches, are your best choice. Almost two decades ago, responding to racetrack noise abatement rules, an engineer named Ray T. Flugger invented a muffler that not only quieted a race car’s exhaust but did so with no decrease in power and, in some cases, a power increase. Flugger showed up at the SEMA Show one year with a big, boxy "Flowmaster" racing muffler. As a joke, he’d welded on a handle on it. Flugger’s product was instantly nicknamed the "suitcase muffler". Ray Flugger soon took the core technology in his Flowmaster race mufflers and applied it to a product for street use. The rest,as they say, “is history”. Today, Flowmaster, Inc. is one of the giants of the aftermarket exhaust business. It’s core product, the Flowmaster Muffler, is considered a benchmark by which racing and street, high-performance exhaust products are judged. These mufflers are designed to use the acoustic energy of exhaust pulses to create low pressure ahead of the muffler. Depending on exhaust valve timing, engine rpm, exhaust system length and volume, this may scavenge the combustion chamber of exhaust gases and that can increase performance. Even if there is no significant scavenging effect, the Flowmaster has reduced restriction compared to OE mufflers and even some aftermarket "performance" mufflers. Less restriction also increases performance. That great "Flowmaster Sound" (best described as "rich" or "throaty") comes from patented "noise cancellation" technology. 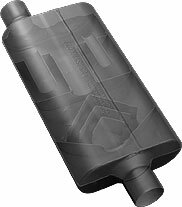 I’ve used Flowmaster Mufflers in street applications ever since the first ones were sold in the early-’80s.Flowmasters are American-made, have great sound, have always performed well and have been quite durable. Currently, I have a ’71 Corvette with a 530hp Big-Block Chevy and a ’95 ZR-1 with a 500hp Automasters-built LT5 and both cars are fitted with Flowmaster 50-Series, 3-inch mufflers (PN53056). Both cars have had these mufflers for a number of years. Not only do I have them on my Vettes, but I run them on every car I own but one and, as soon as I get the time; I’ll stick Flowmasters on my 2001 Camaro, too. Flowmasters are made of MIG-welded, 16-gauge, aluminized steel which offers improved service life compared to most OE-mufflers. In normal use, I have found Flowmaster’s aluminized construction to have comparable durability to stainless steel, no doubt, because of the aluminized heavy-gauge metal. Though case and inlet/outlets are aluminized, the welds are not. To prevent surface rust from developing on the welds, Flowmaster shoots each muffler with silver paint. Therein lies the product’s only small drawback. In some cases, normal exhaust heat will cause the paint to quickly turn brown and flake-off. If appearance is an issue, my solution has been, before installation, to lightly abrade new Flowmasters with Standard Abrasives Handipads then repaint them with Eastwood Exhaust Paint. The above-listed 50-series muffler represents a good choice for street-driven, modified Corvettes with big engines. You want great performance with a subdued, mellow version of the Flowmaster sound? The 50-series units, available in eight different inlet/outlet configurations with pipe sizes from 2.25-3.0 inches, are your best choice. My Delta 50's came in an axle-back kit,the American Thunder,for my '05 C6.Install was straightforward,with plenty of adjustment to get the polished stainless tips oriented perfectly.The sound is deep and throaty as all Flowmaster lovers have come to expect,but toned down to a level that is a quiet burble at cruise.At less than $400.delivered,this kit is an absolute bargain!My exhaust search is over. Pros: Increased performance with great sound! I installed a pair of Flowmaster 40 series with Delta Flow Technology on my '81 4-speed Corvette, and wow!...it is a vast improvement over the stock, restrictive mufflers. I absolutely love the sound improvement!! !....it sounds like a Corvette should without being too overly loud!......I highly recommend this series Flowmasters for Corvettes!! !...the 50 series are too subdued & quiet for my taste, so the 40s are the way to go, my friends!! !.....you will not be disappointed!! !